The Master of Science in Health Administration uses the University of Louisville’s Population Health Leadership (PHL) Competency Model. The PHL Competency Model has 27 competency domains. The competencies are grouped into four areas: (1) Management & Leadership, (2) Critical Thinking, Analysis, & Problem Solving, (3) Communication and Interpersonal Effectiveness, (4) Professionalism & Ethics. 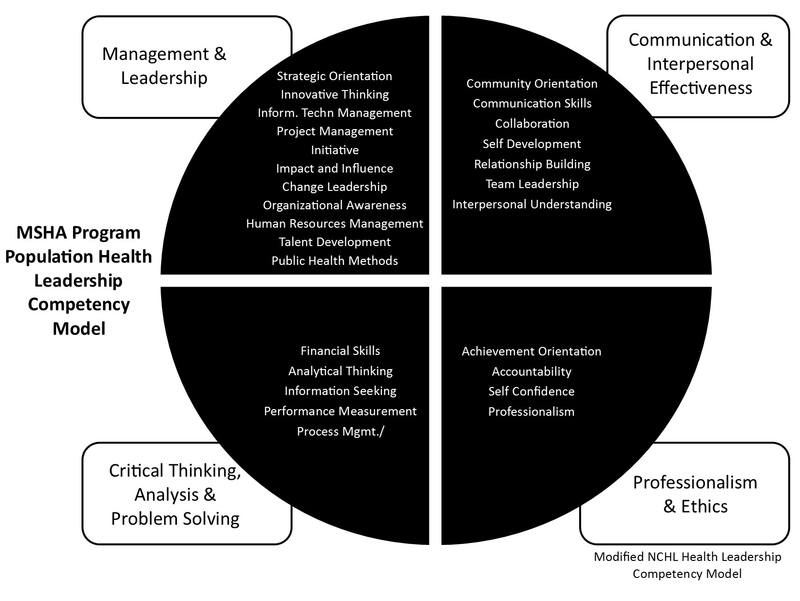 This competency model is a modified version of the National Center for Healthcare Leadership (NCHL) Healthcare Leadership Competency Model™. Self-Assessment – Each student will do a set of self-assessments that measure their self-rated competency attainment along the different NCHL domains. These assessments are completed at the beginning, middle, and end of the program. In addition, there are self-assessments built into many of the courses in the curriculum. Exit interview – All graduating students complete an online assessment and are interviewed by the Program Director to determine how successfully the curriculum improved the student’s competency attainment while in the Program. Alumni survey – All graduates will be asked to respond to a survey three and five years post-graduation. These surveys will measure how they perceive their competency attainment in the Program based on their work experience in the field. MSHA Capstone Course – Students are expected to apply the competencies that they learn throughout the curriculum to community-based projects. The organizations that sponsor these projects will provide feedback to the students about their competency attainment proficiency. Stakeholder Advisory Board – Local employers and other stakeholders will meet twice a year as members of the Health Management Advisory Board. This board will provide feedback about competency attainment among graduates based on their experience as employers of MSHA students.